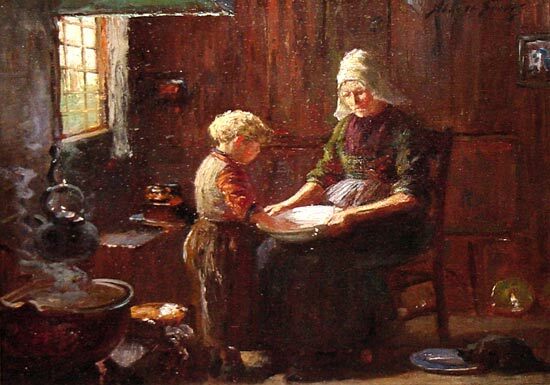 Interior with woman and child, 15"x20", o/c, s.u.r. "Abbott Graves"
Born April 15, 1859 in Weymouth, MA. Studied: Boston Institute of Technology; Cromon, Laurens, and Gervais in Paris. Awarded medal at the Exposition des Beaux Arts, Paris, 1905. Member: National Academy (Associate), 1926; Boston Art Club; Salmagundi Club, 1909; Paris Artists Association (hon. ); Allied Artists Association; National Arts Club, NYC; North Shore Arts Association; among others. In the collection of: National Arts Club, NY; Portland Art Museum, ME.